Note that these trains were and currently are used only for experimental runs. 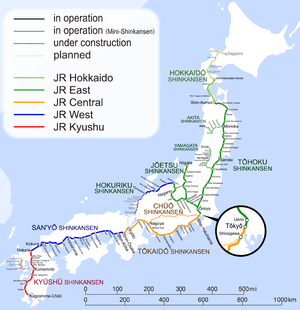 The Shinkansen fare system is integrated with Japan's low-speed intercity railway lines, but a surcharge is required to ride the Shinkansen. Here, an ordinary ticket from Tokyo to Takamatsu is coupled with a Shinkansen surcharge ticket from Tokyo to Okayama, allowing use of the Shinkansen from Tokyo to Okayama and use of local lines from Okayama to Takamatsu. For trips exclusively on one Shinkansen, the ordinary fare and Shinkansen surcharge may be combined on one ticket. ၂၅၆ ၁၅၉ Class 1000 Shinkansen Kamonomiya test track 30 March 1963 Former world speed record for EMU trains. 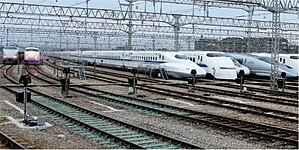 ၂၈၆ ၁၇၈ Class 951 Shinkansen Sanyō Shinkansen 24 February 1972 Former world speed record for EMU trains. 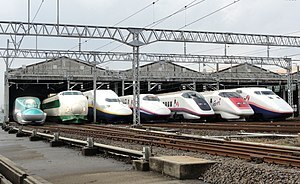 ၃၁၉.၀ ၁၉၈.၂ Class 961 Shinkansen Oyama test track, now part of Tōhoku Shinkansen 7 December 1979 Former world speed record for EMU trains. ↑ Central Japan Railway Company Annual Report 2017. 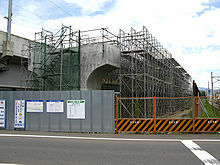 Central Japan Railway Company. 2017. p. 23. Retrieved 26 April 2018. ↑ ၁၄.၀ ၁၄.၁ Smith, Roderick A. (2003). "The Japanese Shinkansen". The Journal of Transport History 24/2: 222–236. Imperial College, London. ↑ Fukada, Takahiro, "Shinkansen about more than speed", The Japan Times, 9 December 2008, p. 3.